This is a mid century modern low dresser credenza by United. It has 3 dovetailed drawers with a streamlined design, and a brass accented side cabinet with 3 more hidden drawers. The the top has an inset angled design, and the base has beautiful arched legs. Dimensions: 54″W x 19.5″D x 32.5″H. 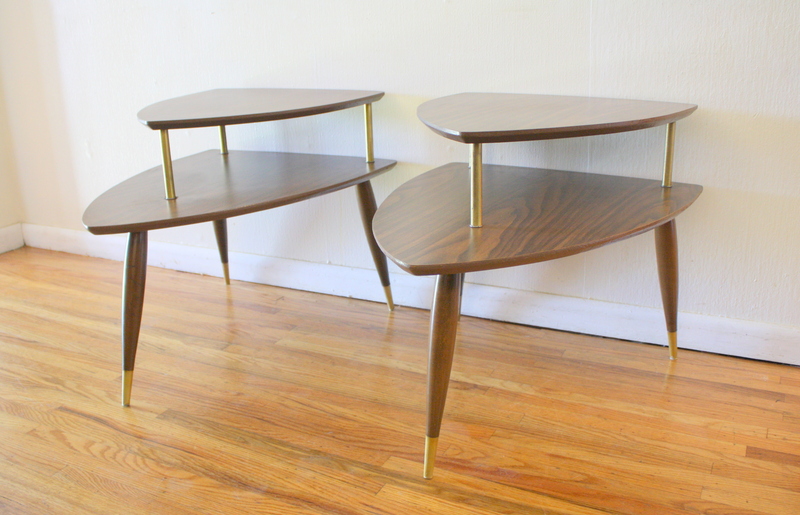 This is a mid century modern coffee table and side end table from the Lane Perception series. The coffee table has a signature double arched base, and 1 dovetailed drawer with a woven design front. Dimensions: 55.5″W x 20″D x 13.5″H. The side end table has 1 dovetailed drawer with the same woven design, and brass accented tapered legs: 22″W x 30.5″D x 20″H. Both Lane pieces are sold. This is a mid century modern arm chair with tapered legs and sculpted arms, newly upholstered in a modern teal tweed. It has a rattan seat back and brass accents in the design. Dimensions: seat width: 19″, seat depth: 19″, seat height 17″, back height 32″. 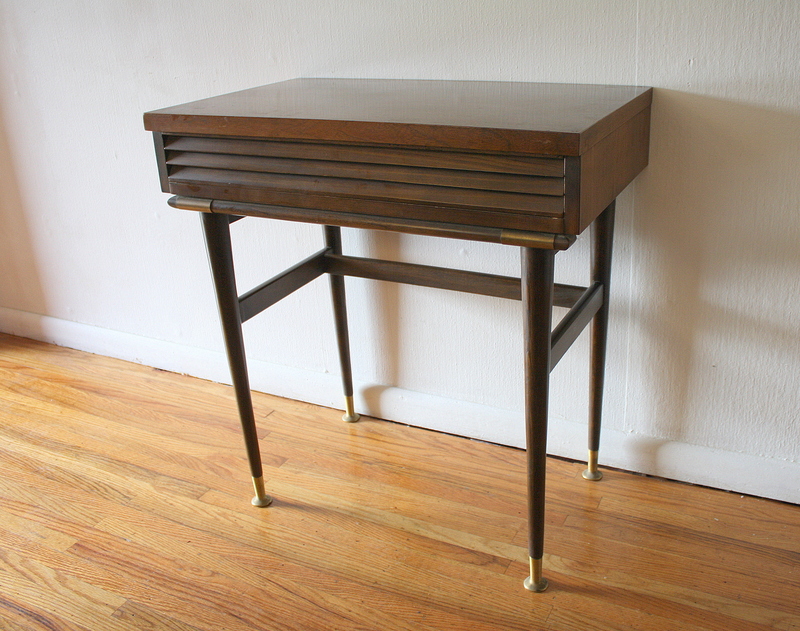 This is a mid century modern vanity console table with a louvered drawer and brass tipped legs and brass accents. Perfectly compact for entryways, a bedroom vanity, or a taller side table. 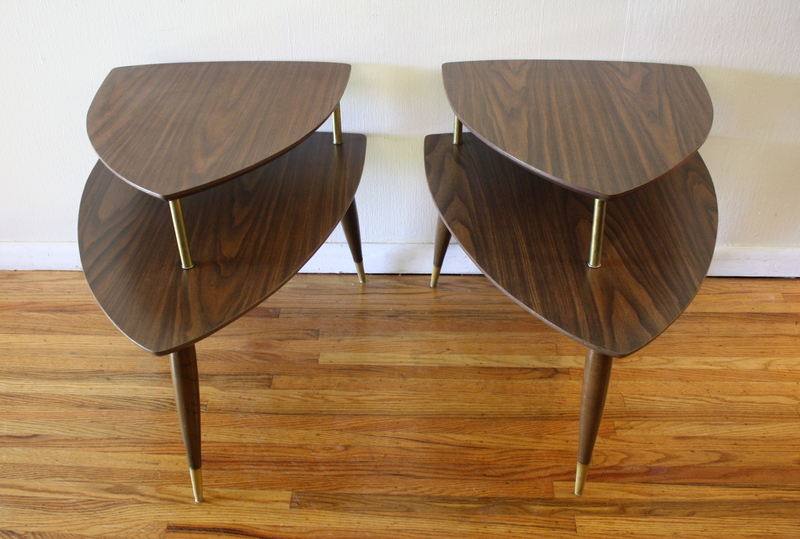 Dimensions: 28″ W x 17″ D x 30″ H.
This is a pair of mid century modern 2 tiered side end tables. They have a guitar pick design, brass accents, and tapered legs. Dimensions: 23″W x 30″D x 16″H (bottom shelf) x 22″H (top shelf).